Sourdough Bread: Day One | carpe diem! As promised to Jo. If you’re not interested, come back tomorrow to help me celebrate the first anniversary of my first post. I’ve given date and time from the timestamp of the photo, so it’s accurate. Note that our kitchen is relatively cold, so your bread may rise much faster than mine: yeast works faster in warmth, which is one reason that ‘bread likes to be big’ as my baking instructor used to say. Large batches rise faster because of the warmth they generate. Another note: Flour. I use a mix of flours for my breads. Roughly 50% is biodynamic stoneground *English* breadflour, which is low in protein by comparison with North American flours. This has many implications. Relatively low protein flours tend to develop richer, more complex flavours, something I like. But… they take up less water than high protein flours (the same weight of flour and water produces a sloppier dough), which makes them a little harder to work if you don’t have a mixer. Protein content is directly related to gluten formation, so the dough can’t hold gas as strongly: it doesn’t rise as high as a high protein flour. See the trade-off? The remaining 50% is the best quality commercial bread flour I can buy, ‘Gladiator’ from Rank Hovis (32kg bags from a local wholesaler), to compensate a bit for the lack of protein. You can adjust your mix to yield the bread you like best. Be wary of wholemeal, though: the husks and other coarse bits act like pins, popping the gas bubbles in the dough. This is one reason so many wholemeal loaves are so… healthily… heavy. I’d use something like Dove’s Farm ‘Wessex’ wholemeal flour, which has been milled much finer than the average — or accept a loaf that doesn’t rise so high. The flavour will be good, regardless of the height. The total weight of the finished dough will be c. 2kg, to yield 3 largish loaves. 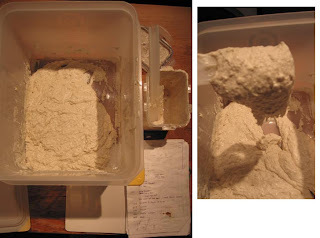 You’ll need: 300g sourdough starter, ideally at 100% hydration; a total of 1040g (1.04kg) of bread flour; 670g bottled/spring water; 1-2tsp salt. Day One, 1830. All the ingredients neatly laid out with my bread notebook, full of scribbled calculations for different weights of doughs of differing hydrations (some so wet they slithered off the oven shelf). The completed sponge (starter plus flour and water) is on the right, to show the texture.